Boat Docks & Piers | Aluminum Boat Docks & Aluminum Piers | Easy Install – Are Roll-Ins Really Easier? Roll-in docks have become almost the default, standard choice for those looking for easy installation and removal. Their prevelence in the marketplace would seem to validate their utility. But is their reputation justified? If your yard is too small to support the entire length of your pier, then their advantage becomes a disadvantage, even a hinderance. Roll-ins come in a variety of unit-sizes and general capabilities. Some can be hauled out of the water in their entirety with a vehicle or winch, and others are made to be handled a section at a time. Some work either way. If your shoreline permits your entire pier to be pulled onto shore in one piece, and if you (and possibly your neighbors) don’t mind the pier stored that way in your yard, and if there is vehicular access over your lawn, then a roll-in pier might make perfect sense. Only very short roll-ins can be removed by hand, which means that you have to have a yard that accommodates a vehicle, or you will need some kind of anchor for a (long) winch. A winch works fine for removing your pier, but a winch that will push your pier into the water in the spring is probably a few years off. Some roll-in piers allow for L’s and T’s at the end that have their wheels oriented so that they roll in right along with the main (outbound) sections. While this method works fine for a certain length of pier, it begins to be a problem for longer piers and very short piers. For a longer pier with an L at the end, the additional drag on that side will tend to pull the pier in that direction. Eventually your pier will have to be repositioned. If your pier is long enough, that additional drag on one side will actually make your pier curve. For a very short pier the winch method or a rope attached to your vehicle has problems because the drag caused by the L will tend to pull the shore end of your pier toward the L. Attach a string to a paper L cutout and pull on it to see what we mean. These “L” limitations are obviously magnified for softer bottoms and bottoms with rocks. Even with shore-facing wheels, an L is going to be limited to one or maybe two sections in length. The lopsided torque on the other sections will make a longer L feature or especially a U shape unfeasible for a “one-shot” pier. The roll-in manufacturers solve that issue the same way sectionals do – with separately installed sections. Last but not least, there is a practical limit to how long a one shot pier can be. That maximum depends on the manufacturer and on your lake bottom. There are a whole host of reasons why you might have to install, remove and/or store your roll-in pier as sections or parts, such as limited storage space, courtesy to neighbors, terrain, weight, or for the configuration reasons cited above. In such cases, the advantage of the roll-in diminishes, and in many cases becomes a disadvantage. Roll-in sections are usually fairly long compared to the sectionals. That’s because they are only lifted at one end. There are two disadvantages with this. First, long sections require trusses to reinforce them (otherwise they would be too heavy), which makes them look like the old TV towers laid on their side. Second, each section must be rolled out and then “parked.” Longer sections require more to-and-fro movement to achieve alignment with the connection hardware. Although “parking” seems intuitively easy, remember that you are in the water, and there’s going to be water resistance. The deeper you go, the more resistance (mostly on yourself) you will encounter. But that’s not the biggest problem. When you push or pull a roll-in section, you obviously have to lean toward or away from it in order to make it go. That works fine in shallow water, but in deeper water, where you are neutrally buoyant, leaning no longer works as well, if at all. It goes without saying that most installations and removals occur precisely when you do not want to be in the water anyway. 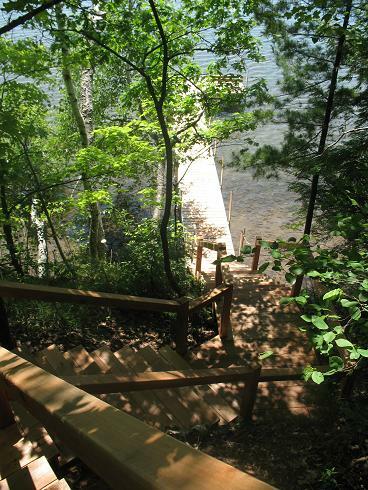 Roll-ins that require you to install your pier in separate parts will, in most cases, require in-water maneuvering. There are roll-ins whose installation method takes “advantage” of floating aids to keep you from having to enter the water. Putting a flotation piece in place, slowwwwwly moving the section into position, and then removing the flotation piece (before it floats away) seems small justification for a pier that’s supposed to be easier than a non roll-in. And would you ever believe that to be practical for one person? Incidentally, there are sectional piers which employ the same strategy for installation and removal. One wonders what the real difference between these two piers would actually be. Keeping the installer out of the water while requiring hour upon hour of work hardly seems like a worthwhile tradeoff. Worst of all, imagine installing this way in rough or windy conditions. When you consider that wheels cost more than footpads and have more that can go wrong, roll-in piers that are installed piecemeal offer little or no real advantage over even regular sectional piers. When compared with Pier of d’Nort, these roll-ins don’t stack up at all, figuratively or literally. To sum it up, unless you can drive a roll-in pier in and out, Pier of d’Nort stands alone as the easiest pier on the market come spring and fall.